Zweites Remake des Klassikers von 1913: Prag in den 1880ern. Balduin hat sich in Julia verliebt, doch den armen Studenten und die Operndiva trennen Welten. Dies ändert sich, als der geheimnisvolle Dr. Carpis, ein ehemaliger Liebhaber Julias, Balduin sein Spiegelbild wegnimmt. Beim Spiel nimmt Balduin Baron Waldis, einem Verehrer Julias, sein Vermögen ab. Als der Baron ihn wenig später zum Duell fordert, bittet Julia Balduin, das Leben seines Gegners zu schonen. Doch seine Eifersucht, angestachelt durch Dr. Carpis, und das herumgeisternde Spiegelbild versetzen Balduin dermaßen in Rage, dass er Baron Waldis tötet. Um den Spuk zu beenden, schießt Balduin auf sein Spiegelbild und sinkt tödlich getroffen zu Boden. Second remake of the 1913 classic: Prague in the 1880s. Baldwin has fallen in love with Julia, but the poor student and opera diva are from two very different worlds. This changes when the mysterious Dr. Carpis, a former lover of Julia, buys Balduin's reflection. In a game of cards, Balduin ruins Baron Waldis, an admirer of Julia. When the baron later demands the two fight a duel, Julia begs the baron for his opponent's life. But Balduin's jealousy, spurred on by Dr. Carpis, and the haunting reflection in the mirror push him into a rage and he takes Baron Waldis' life. To finally put an end to the nightmare, Balduin shoots at his reflection in the mirror and falls mortally to the ground. DVD-R is in German with switchable English subtitles. Softness and pixellization with a few interruptions in the film from poor transferring. Approx. 105 mins. + a 20 min. contemporary newsreel. 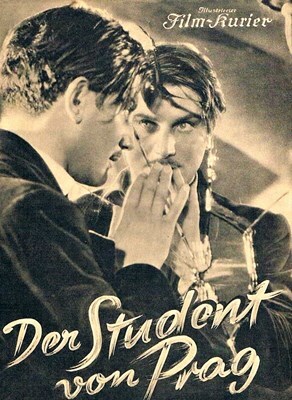 This third version of THE STUDENT OF PRAGUE made in 1935 and is pretty much faithful to the 1913 and 1926 versions except for some character and plot changes. The original story's premise is simple: A poor student (circa 1800's) named Balduin loves an aristocratic woman named Magrit but she's betrothed to Baron Waldis. Balduin signs a pact with Scapinelli who's interpreted to be the Devil in disguise by offering him 100,000 gold coins to woo the countess in exchange for anything in his room. Since Balduin as nothing of value, he figures what the hell and accepts the pact. Well that's what breaks loose when the stranger releases his reflection from a mirror and it's not too soon before the student's evil double makes his life a living hell by ruining his plans. The 1913 version starred Paul Wegener (1974-1948), best known for his GOLEM films, and the second version made in 1926 starred Conrad Veidt (1893-1943) as Balduin and Werner Krauss (1884-1959) as Scapinelli who has more to do here since Krauss became an important character actor since 1920's THE CABINET OF DR. CALIGARI. This time Balduin is offered 600,000 florins, probably due to post-WW! inflation. This version has better production values and Veidt is shown more tormented by his mistake as only Veidt could do. The 1935 version casts Adolf Wohlbruck (1896-1967), who was soon to become Anton Walbrook after he left Germany before his homosexuality and being half Jewish became a problem with the Nazis, as Balduin who's also a noted fencer as in previous versions. The character of the countess Margit is replaced with an opera singer named Julia played by Dorothea Wieck (1908-1986) best known as the teacher in 1931's MADCHEN IN UNIFORM. Her singing is dubbed by the opera singer Miliza Korjus (1909-1980). Scapinelli becomes Dr. Carpis played by Theodor Loos (1883-1954), another well-known character actor who seems to be channeling Krauss. It's possible the villain Scapinelli's name was changed to Carpis because Germany didn't want to offend their fellow-Fascist friend Mussolini and his country. Carpis has more to do here than Scapinelli in earlier versions as he's now Julia's former lover who's jealous of the rich Baron, seen more as a fop here, and of Balduin's attention. When he shows up unexpectedly in her room and she asks where he came from, he answers with: "Where you are not... is Hell for me" making his character more figuratively a devil than literally as in the previous versions; later Balduin will call Carpis a "devil" in anger. Carpis uses the Baron and Balduin to hurt Julia but this time there's no written contract with money but instead Balduin is given the power to make money by gambling. Instead of releasing Balduin's reflection, he imprisons Baldwin's good side, the "sentimental dreamer" inside the mirror by cloaking it to allow Balduin's bad side to take over. As in the earlier versions. both sides come face- to-face using camera tricks as his good side that escaped from the mirror silently pursues him to incense his actions while making him feel guilty with increasing madness. As in previous versions, when a duel prearranged to spare the Baron's life (not shown in other versions but only its aftermath) goes wrong, he's shunned by everyone. Balduin eventually realizes the extent of what he's become, and finally confronts his reflection in the mirror to free himself. Their final meeting is the film's highlight and one of Wohlbruck's best performances, and on a par with Veidt's baroque one. THE STUDENT OF PRAGUE was the last film directed by Arthur Robison (1883-1935) who also directed 1923's Expressionistic classic WARNING SHADOWS that used no subtitles and let the story unfold through stunning imagery. 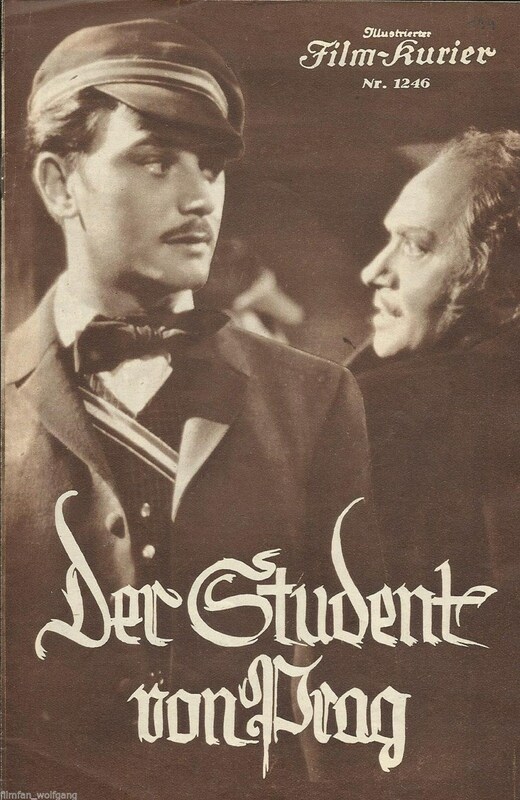 There's some of that photography by Bruno Mondi (1903-1991) in STUDENT but not a lot because the Nazis mostly frowned on anything connected to the Weimar era when Mondi shot Fritz Lang's DESTINY (1921)also known as DER MUDE TOD and also eleven of Veit Harlan's films after STUDENT. Theo Mackeben's suspenseful Hollywood-style score gives the right menacing mood when needed; Mackeben ((1897-1953) was a versatile composer who also wrote operas. It's difficult to find contemporary reviews in English except for a mixed but mostly negative one from Graham Greene (1904-1991) who thought the film's allegory was "on the right side of imagination in an unimaginative industry" and praised Robison's trademark touches, "his slow decorative methods, the curious ballet-like quality he procured by the constant panning of his camera. But dull the film undoubtedly is: a curiosity, a relic of the classical German film of silent days.... The acting doesn't help" and he preferred Veidt's version. I heartily disagree about this STUDENT being dull and the acting not aiding the story, If you liked the previous versions, you should watch this one especially if you're a fan of Wohlbruck/Walbrook. The story, photography, and his performance will remind you of the 1949 English fantasy-horror film THE QUEEN OF SPADES where Walbrook plays a poor Russian soldier who sells his soul for financial gain and it's more than likely its director Thorold Dickenson remembered this STUDENT when he cast and made his film. For a Nazi-era film, STUDENT is free of propaganda and you can get a good copy here. This site's disclaimer that "Softness and pixellization with a few interruptions in the film from poor transferring" is hardly noticeable and will not deter your enjoyment. Thank you folks for acquiring this film. I've waited a long time to see it and it was worth it.